Penn Elcom 323XLK series of 19-inch rack drawers are the most economical solution to storing non-rack mountable equipment, tools or consumables. Each drawer is equipped with a slam latch and a key lock for added security (2 keys included). It has a flush front design maximizing the internal storage space and also giving it a sleek look. This 2U rack drawer unit is fabricated from steel and has a black powder coating. 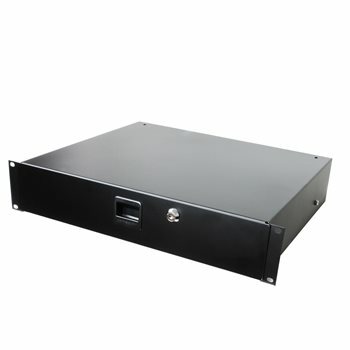 It is designed to be easily mounted into a rack profile with cage nut sets. Penn Elcoms 3232LK drawer extends smoothly from the rack on high quality sliding runners that support up to 48lbs or 22kg inside.